The Natural History Museum's Dippy the diplodocus will be taken off display in early 2017, having been seen by generations in its current location. Here's all you need to know about London's most famous dino. Who or what is Dippy? Dippy is the diplodocus skeleton which takes pride of place in the Natural History Museum's Central Hall (also known as the Hintze Hall). You'd have to be an expert to tell, but Dippy isn't a real dinosaur skeleton. It's a model made from plaster of Paris, based on a diplodocus skeleton unearthed in Wyoming in 1898. 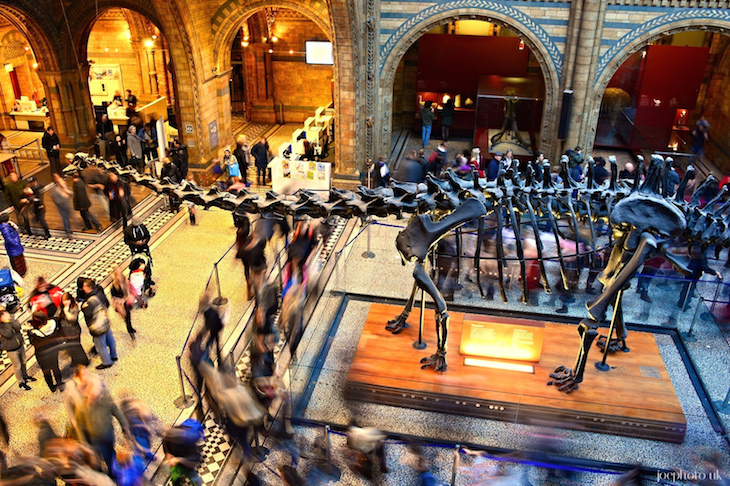 From kiddy sleepovers to adults-only lates, we bet Dippy's seen a thing or two in its time, as it's stood guard over the museum's main entrance. Dippy's not the only Dippy; it's one of 10 replicas around the world. The Carnegie Institute in Pittsburgh has a full model, rather than just a skeleton. London ended up with a replica when King Edward VII took a fancy to drawings of the original skeleton, owned by Scottish-American millionaire businessman Andrew Carnegie. Carnegie commissioned a replica for the king, which is the one in the museum today. Not to come over all Night at the Museum or anything, but the skeleton moves — or at least it has done, once or twice. The neck and tail have both been repositioned during the time it has been on display at the museum, reflecting changes in scientific knowledge about what the creature would have looked like. During the second world war, the skeleton was disassembled and stored in the museum's basement to protect it from damage, in case the museum was bombed. Dippy will be taken off show while conservators on the museum work to restore it. This work will take a round a year (292 is a lot of bones to polish and bubble wrap) before going on a three-year tour of eight venues around the UK, starting with the Dorset County Museum, which appropriately sits on the Jurassic coast. The museum's 4.5 tonne blue whale skeleton has been hanging (literally) around for 81 years waiting for its turn in the spotlight. 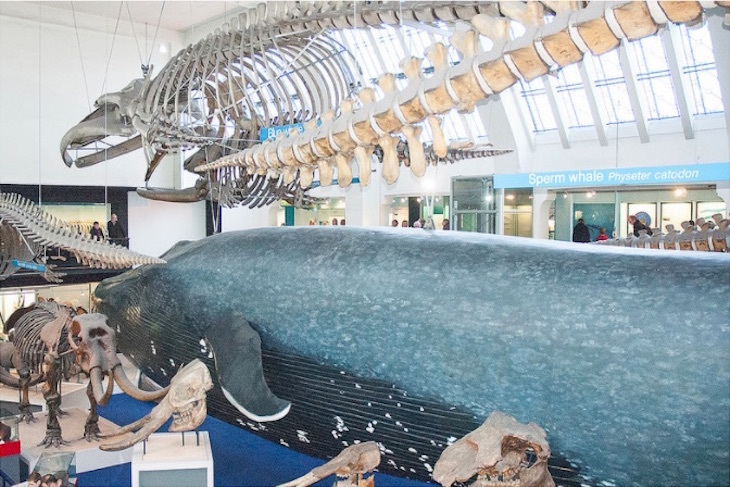 It's been suspended from the ceiling of the Mammals Hall, accompanied by a life-size model of a blue whale. Unlike Dippy, the blue whale skeleton is a real skeleton. It was beached in Wexford Harbour in Ireland in 1891, and the museum subsequently acquired it. Anyone who's visited the museum's Mammals Hall in recent months will know that work on moving the whale is already under way. As the largest animal on earth, it's bound to be an impressive welcome to the museum. We just hope someone's thought to reinforce the ceiling. Dinosaur fans won't be missing out though; the museum will still be home to the world's most complete stegosaurus skeleton (Sophie, to her friends), an animatronic t-rex, and every kid's favourite, the dinosaur gift shop. You can see Dippy in situ at the Natural History Museum's Hintze Hall until 5 January 2017 (you can have one last hurrah at the museum's New Year's Eve ball). The blue whale will not be in situ until summer 2017, when it will be unveiled in the Hintze Hall (swapping a dinosaur for a whale was never going to be a one-day job). Several other changes will be taking place in the hall, including the addition of 10 new display bays. Some parts of the museum will be closed during this time — keep up to date here. Of course, the most important question of all is this; what nickname will the blue whale be given? Dippy came about out of the affection the public (and Carnegie himself) had for the dinosaur, but Bluey doesn't have the same ring to it somehow. Still, somewhere in an office in the bowels of the museum, the marketing team is thanking its lucky stars that it's not a sperm whale replacing Dippy. No sniggering at the back. 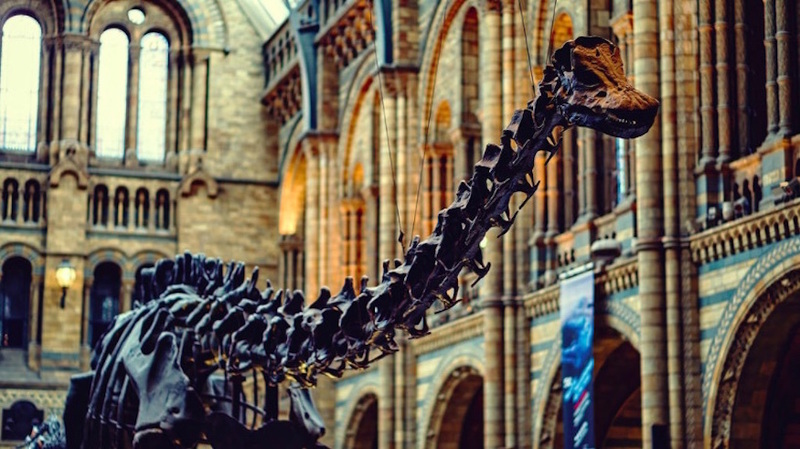 9 reason why Dippy the diplodocus must go.